Angus King was long out of office by the time a law passed that benefited the wind business he co-founded. 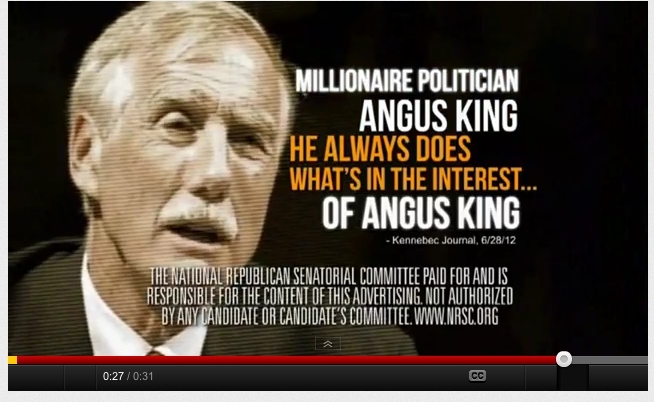 The National Republican Senatorial Committee mounts a second attack on independent U.S. Senate candidate Angus King’s wind business in this ad. The claim here isn’t quite as misleading as those in a previous NRSC ad. A Truth Test earlier this year found two claims in the previous ad — one on King’s wind career and one on bills that Democratic Senate hopeful Cynthia Dill sponsored as a state legislator — false. One of the ad’s claims, calling Dill liberal, was deemed (not shockingly) true. The ad refers to a law the Legislature passed and King signed in 1997, requiring that at least 30 percent of Maine’s energy supply comes from renewable sources. But the law had no practical impact, because 50 percent of Maine’s energy was already coming from renewables, in particular biomass and hydroelectric power. In effect, the law was a floor, not a threshold the state had yet to cross. King’s successor, Democratic Gov. John Baldacci, signed a new law updating the renewable energy requirements in 2007, several years after King left office. The updated law requires the development of new renewable resources. “The whole point of that (law) was to encourage new development of wind or solar,” said Sharon Reishus, Public Utilities Commission chairwoman from 2008 to 2010 and now a private consultant in Massachusetts..
Reishus said the updated law would have benefited King, who co-founded Brunswick-based Independence Wind in 2007, the same year the renewable energy standard was changed. King divested his share of it in March 2012. He has told the Portland Press Herald that he netted $212,000 from Independence Wind, taking into account expenses and income. Rob Gardiner, King’s former business partner in Independence Wind, has said that since demand for electricity has decreased since 2007, the newer law hasn’t really aided the wind industry. If King benefited, it was because a new law went into effect by 2008, when he was long out of office and the year after he got into the wind business. By neglecting to note the change, the NRSC ad implies to the viewer that King signed the law, left office and directly benefited from it. A lot happened after he signed the law at issue. Verdict: The law King signed wasn’t the main effective component of this piece of state policy, though it was the base, putting a grain of truth in the claim if you interpret King’s benefit very broadly. But the law Baldacci signed had real teeth and was more important for the wind industry. It’s dishonest not to note the change between the two administrations. That’s where the impact was. We rate this claim mostly false. — Staff Writer John Richardson contributed to this report.